Late mortality in septic patients often exceeds the lethality occurring in acute sepsis, yet the immunoinflammatory alterations preceding chronic sepsis mortality are not well defined. We studied plasma cytokine concentrations preceding late septic deaths (days 6–28) in a murine model of sepsis induced by polymicrobial peritonitis. The late prelethal inflammatory response varied from a virtually nonexistent response in three of 14 to a mixed response in eight of 14 mice to the concurrent presence of nearly all measured cytokines, both proinflammatory and anti-inflammatory in three of 14 mice. In responding mice a consistent prelethal surge of plasma MIP-2 (1.6 vs 0.12 ng/ml in survivors; mean values), MCP-1 (2.0 vs 1.3 ng/ml), soluble TNF receptor type I (2.5 vs 0.66 ng/ml), and the IL-1 receptor antagonist (74.5 vs 3.3 ng/ml) was present, although there were infrequent increases in IL-6 (1.9 vs 0.03 ng/ml) and IL-10 (0.12 vs 0.04 ng/ml). For high mobility group box 1, late mortality was signaled by its decrease in plasma levels (591 vs 864 ng/ml). These results demonstrate that impeding mortality in the chronic phase of sepsis may be accurately predicted by plasma biomarkers, providing a mechanistic basis for individualized therapy. The pattern of late prelethal responses suggest that the systemic inflammatory response syndrome to compensatory anti-inflammatory response syndrome transition paradigm fails to follow a simple linear pattern. The life of a hospitalized septic patient continues to be seriously threatened despite the increasing sophistication of current standard intensive care procedures implemented throughout developed countries. In the United States alone, sepsis accounts for ∼9% of the overall annual mortality (1, 2) with 44 deaths per 100,000 population (3). In-hospital mortality is especially prominent among the elderly, reaching 29% in severely septic patients (1). The substantial mortality and increasing economic costs propel sepsis research toward a better understanding of its basic immunity to devise more effective therapeutical approaches. To date, the majority of all phase III clinical trials aiming to block the activity of leading inflammatory cytokines such as TNF (4, 5, 6) or IL-1 (7, 8) failed to deliver the anticipated results. Retrospective statistical analyses of both preclinical studies (9) and human clinical trials (10) implied that anti-inflammatory interventions may be potentially successful when targeting patients with an increased risk of death. Several studies demonstrated that the levels of circulating cytokines such as IL-6 highly correlate with outcome in the early phase of sepsis both in humans (11, 12, 13) and mice (14, 15, 16, 17, 18), making stratification of the patient population more realistic. The novel design of the Monoclonal Anti-TNF: A Random Controlled Sepsis (MONARCS) trial capitalized on acute sepsis studies, showing a modest albeit significant reduction in 28-day all-cause mortality after patients were treated with anti-TNF Ab when their initial IL-6 plasma level was elevated (19). The rationale of prospective anti-inflammatory intervention based on defined biomarkers appears to be a promising long-term direction in the therapy of acute sepsis. The current modes of treatment in sepsis are designed to target the early sepsis hyperinflammatory phase, which is characterized by excessive production of proinflammatory mediators and termed the systemic inflammatory response syndrome (SIRS)3 (20, 21). Such an approach, however, fails to focus on the disease period when SIRS is thought to be followed by the development of the compensatory anti-inflammatory response (hypoinflammatory phase) syndrome (CARS). It is clear that sepsis-related deaths are not restricted solely to the early phase of the disease, but whether chronic-phase deaths are preceded by any common biomarker that may serve as an indicator of impending mortality has not yet been investigated. Clinical trials show that patient lethality during the chronic phase of sepsis remains frequent (4, 5, 6, 7, 8, 10, 19, 22). Late mortality is also observed in murine polymicrobial peritonitis, the most adequate animal model of sepsis to date (14, 15, 23, 24, 25, 26). The late deaths only became apparent, however, when animals were followed for extended time period (up to 28 days). We investigated the prelethal immunoinflammatory fluctuations encountered in the late phase of sepsis by profiling the protein expression of circulating inflammatory cytokines. The data suggest a bimodal immunoinflammatory response in chronic sepsis; late deaths were preceded by the overexpression of both proinflammatory as well as anti-inflammatory cytokines, albeit at much lower levels and with more heterogeneity in comparison to the response observed in acute sepsis. In the current study we also show that predictions of late-phase sepsis mortality based on plasma biomarkers can be highly accurate. Female ICR outbred mice (Harlan Sprague Dawley) with an average weight of 22 g were used. The mice were acclimated to the laboratory environment for at least 48 h before surgery and housed in a temperature-controlled room with a 12-h light/12-h dark diurnal cycle after the procedure. All experiments were conducted in accordance with guidelines of the National Institutes of Health (Bethesda, MD) and the University of Michigan Animal Care and Use Committee (Ann Arbor, MI). The experiment investigated the inflammatory response of chronic (days 6–28; n = 83) sepsis. To ensure adequate reproducibility, surgeries were performed on separate groups of mice. The model of cecal ligation and puncture (CLP) closely emulates the polymicrobial sepsis occurring in the human population and has been widely accepted and used by other investigators to study the immunopathology of sepsis (15, 27, 28, 29, 30). We used an 18-gauge needle to obtain ∼50% mortality during the early phase of sepsis (days 1–5). The original CLP protocol was followed (31) and previously described modifications were implemented (27). All animals that survived the period of acute sepsis (days 1–5) were sampled between days 6 and 28. Mice were not sacrificed at the time of sampling and blood was collected when an animal appeared ill (based on weight loss and physical activity). For comparison, two healthy-appearing mice who also underwent CLP and were at the same postoperative day were simultaneously sampled. To collect peripheral blood, the distal tail was clipped (∼2 mm) and a 20 μl of blood was drawn into a pipette rinsed with EDTA (169 mM tripotassium salt). Only samples from animals that died within 24 h after blood collection (and from matching healthy mice) were analyzed. Overall, 14 dying mice (of 20 total) were sampled providing 14 triplets (one moribund plus two healthy) collected in the chronic phase of sepsis. Fig. 1⇓ shows the temporal distribution of sampled animals. All samples were immediately diluted 1/10 in PBS with a 1/50 dilution of EDTA and centrifuged (5 min at 1000 × g at 4°C), and the plasma was removed and stored at −20°C until analysis. 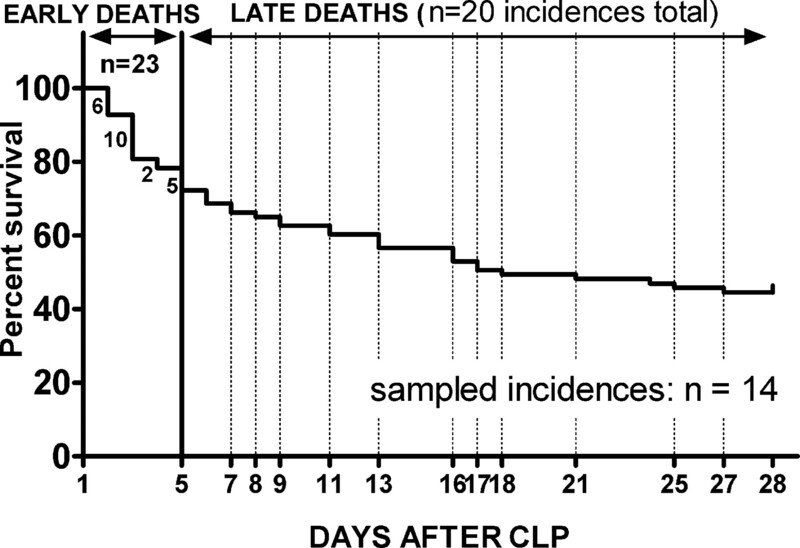 Twenty-eight day mortality after CLP-induced sepsis. CLP was performed (n = 83) with an 18-gauge needle to produce ∼50% mortality. Mortality was monitored for 28 days and the deaths were separated into two groups: early (days 1–5) or late (days 6–28). Plasma was sampled only in the chronic phase of sepsis from animals that appeared moribund based on weight loss, activity, and temperature. Every sampling of a moribund animal was simultaneously accompanied by the sampling of two healthy-appearing mice at the same post-CLP day for reference values. There was a total of 20 deaths recorded between days 6–28 (20 of 42) and 14 of these animals were sampled together with matching reference animals (healthy-appearing post-CLP mice) producing 14 triplets (two healthy and one moribund). Dotted lines indicate the days on which sampled mice died. All 14 samples from the moribund mice were obtained within 24 h of death. We used a recently validated microarray immunoassay methodology with a capacity to simultaneously measure 16 mouse cytokines (32). The microarray immunoassay technique features nitrocellulose pads (affixed to glass slides) for Ab spotting and biotin-conjugated Abs for target detection. The microarray immunoassay was performed using standard spotting equipment and fluorescence slide readers as detailed elsewhere (32). High mobility group box 1 (HMGB-1) levels were measured by Western immunoblotting analysis as described previously (33). In brief, serum samples (25 μl) were fractionated by SDS/PAGE, transferred to a polyvinylidene difluoride immunoblot membrane (Bio-Rad), and probed first with the primary anti-HMGB-1 serum (rabbit, 5 μg/ml) and then with the secondary Ab (donkey; 1/5000 dilution). Polyclonal anti-HMGB-1 IgG was purified by using protein agarose according to the manufacturer’s instructions (Pierce). Western blots were scanned (Silverscanner II; LaCie), and the relative band intensity was quantified with the graph-digitizing software UN-SCAN-IT 5.1 (Silk Scientific). The levels of HMGB-1 were determined by reference to standard curves generated with purified HMGB-1. The Kaplan-Meier 28 day-survival curve (Fig. 1⇑) was plotted using Prism 4 (GraphPad Software). To increase the statistical power for the body weight calculations (Figs. 2⇓B and 3⇓), a larger set of animals was used; additional measurements were added to the original group (n = 83), supplementing both acute (71 values total) and chronic (33 values total) sepsis data sets. Supplementary data points were collected during two separate studies from animals subjected to a CLP protocol identical with the one presented here. Body weight data sets (Figs. 2⇓ and 3⇓) were expressed as the mean ± SEM and analyzed using the Student’s t test. Significance was assigned where p < 0.05. Cytokine levels recorded in a chronic sepsis experiment (Figs. 4–7⇓⇓⇓⇓) are represented by bars. Each individual bar represents a single animal, either moribund (within 24 h of death) or healthy (matching animal post-CLP day). A total of 14 triplet sets (one moribund and two healthy) representing the mortality recorded on different days in the late phase of sepsis (day 6–28) are presented. The receiver operating characteristic (ROC) curve was used to evaluate the prognostic accuracy (defined by the area under the curve (AUC)) of the analyzed cytokines and determine the sensitivity and specificity (percentage) at selected cutoff values (Table I⇓). The 95% confidence intervals for the AUC values were estimated using the conservative bootstrap bias-corrected and accelerated (Bca) method to obtain more accurate intervals (34, 35). The accuracy of the ROC-AUC test is rated as follows: 0.9–1, excellent; 0.8–0.9, good; 0.7–0.8, fair; 0.6–0.7, poor; and <0.6, not useful. The p values listed in Figs. 4–7⇓⇓⇓⇓ (upper panels) indicate the statistical significance (p < 0.05) of the scoring system. All statistical analyses were performed using SAS release 9.1.2 on Windows (copyright 2002 and 2003 by SAS). Cytokine levels below the limit of detection were assigned a value that was equal to one-half of the lower limit of detection in the standard curve. Body weight (BW) during the acute phase of sepsis. A, Among surviving mice there is a rapid decline in body weight during the first 5 days post-CLP that reverses about day 6 or 7 with subsequent continuous weight gain up to day 28. 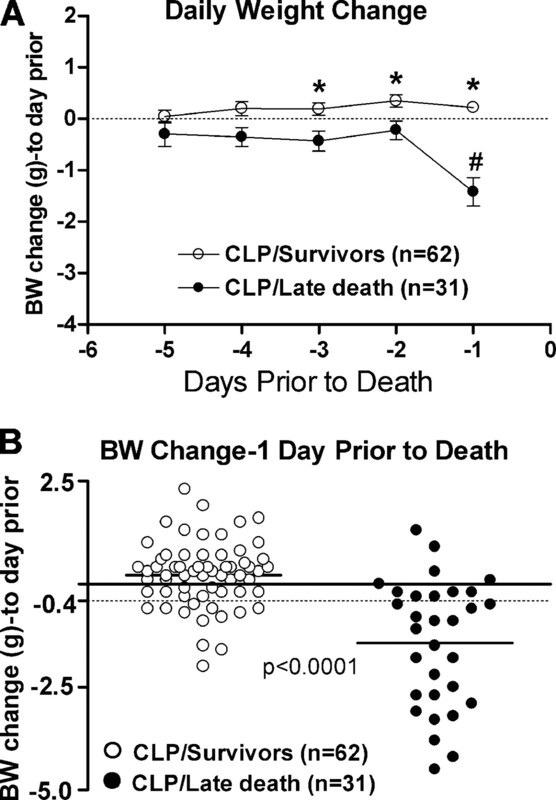 B, Mice dying within the first 5 days of CLP-induced sepsis either gain, remain stable, or loose negligible weight in comparison to the dramatic weight loss recorded in survivors. Each value is the mean ± SEM. ∗, p < 0.05 alive vs dead. Data in B: alive mice, n = 81 each day; dead mice, n = 40 on day 2, n = 7 on day 3; n = 10 on day 4, and n = 6 on days 5 and 6. Body weight (BW) changes in chronic sepsis. A, Data are graphed as the body weight change during the chronic phase of sepsis relative to the day of death rather than the day post-CLP. During the chronic phase of sepsis there is a significant loss of body weight before death that was statistically significant even 3 days before death. B, The changes in body weight in the 24 h before death are highlighted; in nearly all cases a dramatic weight loss was observed. Each symbol is an individual animal. The dotted line at −0.4 represents the optimal separation of the survivors vs late deaths as determined by ROC analysis. A is mean ± SEM. ∗, p < 0.05 alive vs dead on the respective post-CLP day; #, p < 0.05 comparing day −1 to day −2. Prelethal levels of HMGB-1 in chronic sepsis. The plasma concentrations of the late-response HMGB-1cytokine in healthy (H) and moribund (M) mice were graphed to demonstrate the prelethal concentrations during the chronic (days 6–28) phase of sepsis. Animals were sampled in triplets (two healthy and one moribund) and healthy animals were the same post-CLP day as the moribund mouse. A, Typical blots from animals collected on day 7 or day 27 during the chronic phase sepsis. B, Scatter graph compares the individual HMGB-1 concentrations in moribund and healthy animals. C, HMGB-1 concentrations at different time points post-CLP. Each scatter point (B) or bar (C) represents an individual animal. The dotted horizontal line represents the optimal concentration for predicting outcome. There is no statistical difference between two groups as indicated by the p value. Prelethal levels of proinflammatory cytokines in chronic sepsis. 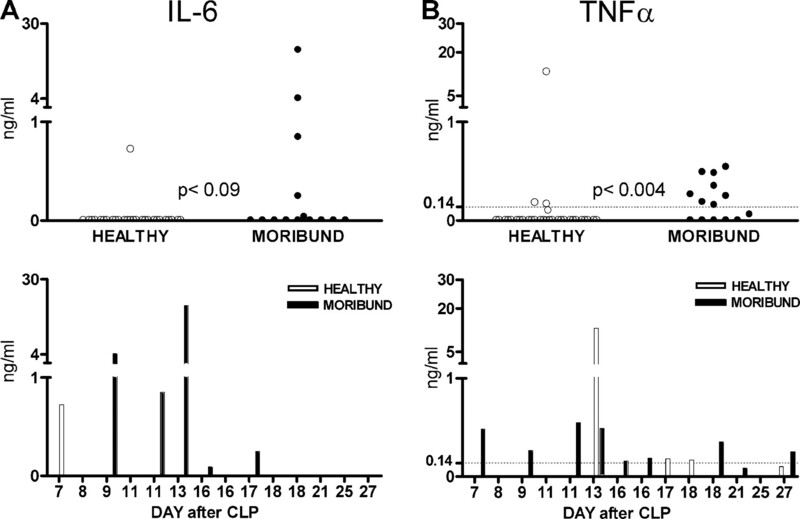 The plasma concentrations of IL-6 (A) and TNF-α (B) in healthy and moribund mice demonstrate the inflammatory response during the chronic (days 6–28) phase of sepsis. Animals were sampled in triplets (two healthy and one moribund) and the healthy animals were the same post-CLP day as the moribund mouse. Scatter graphs (upper panels) demonstrate the individual IL-6 and TNF-α concentrations in moribund and healthy animals that were present within 24 h before death. Bar graphs (lower panels) show the distribution of plasma levels of IL-6 (A) or TNF-α (B) at different time points post-CLP. Each bar/scatter point represents an individual animal. The dotted horizontal line in the bar graphs represents the optimal concentration for predicting the outcome for the TNF values. The p value signifies the statistical difference between the healthy and moribund groups. Prelethal levels of proinflammatory chemokines in chronic sepsis. 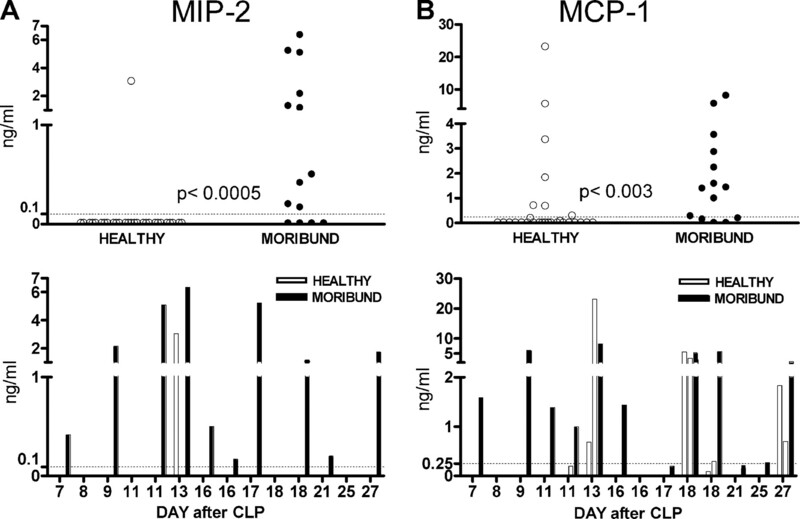 The plasma concentrations of MIP-2 (A) and MCP-1 (B) in healthy and moribund mice demonstrate the prelethal proinflammatory response during the chronic (days 6–28) phase of sepsis. The data were analyzed similarly as in Fig. 5⇑. Prelethal levels of anti- inflammatory cytokines in chronic sepsis. 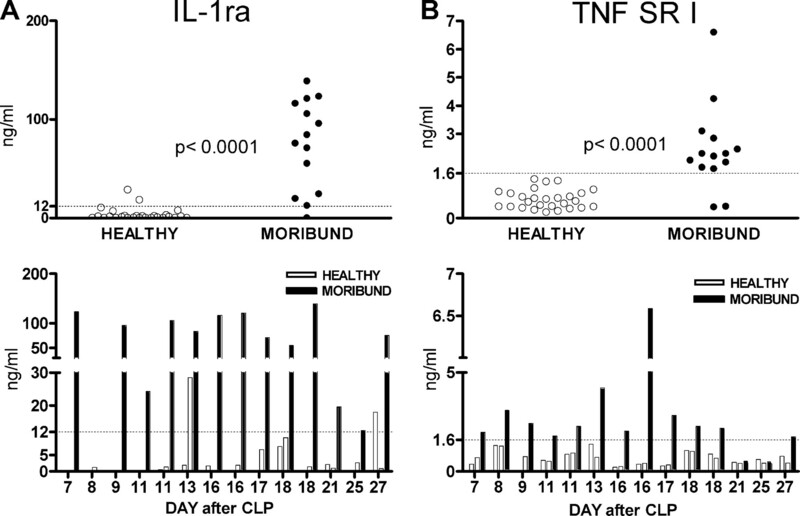 The plasma concentrations of IL-1ra (A) and TNF-SRI (B) in healthy mice and moribund mice demonstrate the prelethal proinflammatory response during the chronic (days 6–28) phase of sepsis. The data are analyzed similarly as in Fig. 5⇑. To generate a more diversified profile of immune responses that would more closely simulate the immunoinflammatory fluctuations occurring in the human population, the genetically heterogeneous ICR outbred strain of mice was used in the study. A total of 83 (Fig. 1⇑) mice were subjected to CLP on day 1 and monitored for 28 days. It has been postulated that the early post-CLP mortality is primarily caused by excessive inflammation (SIRS), whereas the late mortality is predominantly associated with CARS-dependent immunosuppression (21, 36). Given the late sepsis lethality as the focal point of this study, we separated the early mortality (early deaths, days 1–5) from the chronic phase deaths occurring between day 6 and day 28. Such separation has been prompted by a number of recent observations: 1) the excellent prognostic (mortality vs survival) capacity of various inflammatory mediators in early sepsis becomes insignificant by day 5 post-CLP (14); and 2) the prelethal body weight changes occur in bimodal fashion depending on the phase (acute vs chronic) of sepsis (15, 23, 37). The current study shows the following distribution of death: early mortality (days 1–5) reached 53% (or 23 of 43 of total deaths; Fig. 1⇑), whereas the late mortality (days 6–28) was 47% (or 20 of 43) of total deaths. As an initial endpoint, the effects of sepsis on the general physical condition was evaluated by daily monitoring of the body weight changes in both nonsurvivors and survivors throughout the entire course of the study (days 1–28). Additional weight measurements were used to generate Figs. 2⇑B and 3⇑ (see statistical analysis). We previously reported that there is a distinct body change pattern characterizing the early sepsis mortality, with all of the mice dying in the acute phase of sepsis having a notable weight gain compared with the weight loss observed in survivors (23, 38). The findings of the current study show a similar trend of initial weight loss (up to day 6) in all surviving animals due to the combined stress of surgery and infection, followed by a rebound in body weight during recovery (Fig. 2⇑A). 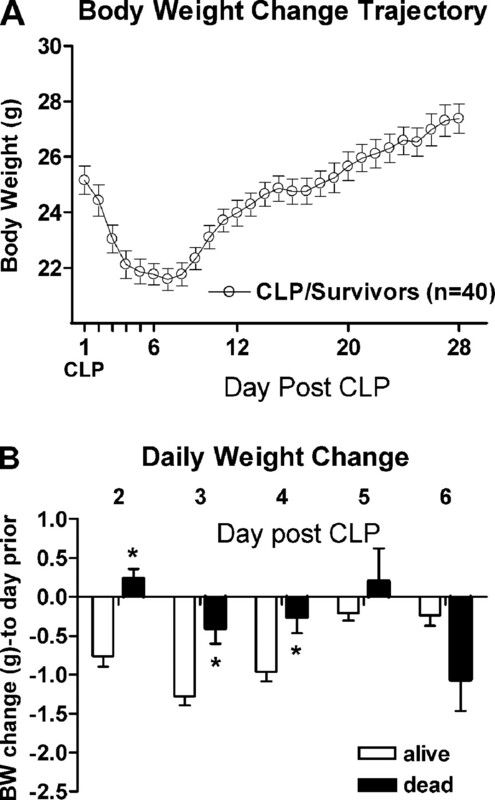 Conversely, all of the mice that died during the first few days after CLP either gained weight (day 2 post-CLP) or lost less weight compared with survivors before death (Fig. 2⇑B). Additionally, Fig. 2⇑B emphasizes that by day 5 there was no longer a difference in the weight change between the survivors and nonsurvivors. This simple and unsophisticated measurement can be a powerful and accurate copredictor of outcome in acute polymicrobial sepsis (15). This prelethal weight gain during first 5 days of acute sepsis is reversed in the late (days 6–28) phase of sepsis. To illustrate this dynamic, the weight of dying mice was graphed on the basis of days before death regardless of the actual day of demise. Consequently, the data are presented relative to the day of death rather than to the post-CLP day. The body weight changes of survivors (displayed in Fig. 3⇑) were determined over the same 5-day time period as the respective nonsurvivors (two survivors per each dying mouse). Nearly all mice (26 of 31) that died between days 6 and 28 lost weight over the 24-h period before death (Fig. 3⇑). Additionally, the disparity between body weight changes between dying animals and their recovering counterparts was already significant 3 days before death. Coupling the current findings with similar data from our recent publication (23), it becomes clear that the prelethal body weight changes exhibit two opposite patterns contingent upon the phase of sepsis in which they occur. Whereas in early sepsis the rapid loss of weight is associated with the high probability of survival, it becomes a marker of imminent death in the late phase of sepsis (days 6–28). Such contrasting phenomena are suggestive that the mechanisms leading to early death are substantially different from those causing late mortality. The proinflammatory cytokine HMGB-1 was recently identified as a late-phase mediator of lethal systemic inflammation (33), and inhibition of its release and/or activity markedly improved survival in the CLP model of sepsis (39, 40). The reported unique delayed mode of HMGB-1 release could translate into a potential therapeutic target for the treatment of sepsis. However, this phenomenon was reported solely with regard to the first 3 days after the initiation of endotoxemia or CLP-dependent sepsis (33, 39, 40). Our definition of the late phase of sepsis (days 6–28) is substantially longer than the original description of the late phase (after 1 day). To establish whether a similar trend of HMGB-1 release is also present in late sepsis, we examined its plasma concentration in animals dying in the chronic phase (days 6–28) of disease (Fig. 4⇑). 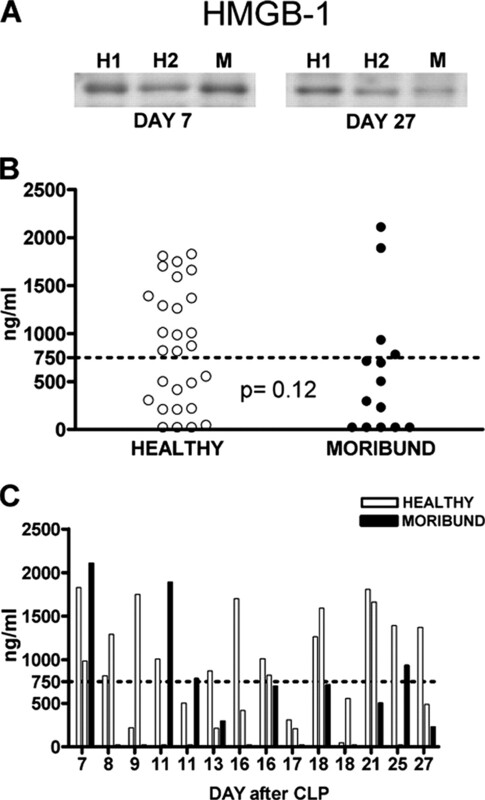 The comparison of circulating HMGB-1 between moribund and healthy animals revealed heterogeneity in its prelethal concentrations (Fig. 4⇑B). In three moribund mice (days 7 and 11) the HMGB-1 level markedly surpassed that noted in matching healthy animals, whereas in the other 11 nonsurvivors the HMGB-1 concentration was generally lower (below the detection limit in four mice) when compared with respective healthy mice (Fig. 4⇑C). Our findings clearly contrast the robust prelethal increase of HMGB-1 in either murine acute endotoxemia (33) or CLP-related peritonitis (40) reported in the original publications. These results further define the role of HMGB-1 as an indicator of infection severity, suggesting that its response to lethal sepsis is not uniform and may vary depending on the phase of the disease (acute vs chronic). In both clinical and experimental settings, deaths during chronic sepsis may exceed those observed in the acute phase of the disease. To gain additional insight into the relationships of various mediator changes before late mortality, we examined the prelethal levels of major circulating proinflammatory and anti-inflammatory cytokines in mice dying of chronic sepsis and compared them with healthy post-CLP animals. The dogma of the SIRS-to-CARS transition implies different inflammatory responses in the early (proinflammatory) and late (anti-inflammatory) sepsis deaths. Mice dying in the chronic phase of sepsis should have low to undetectable levels of proinflammatory mediators. The profiles of inflammatory cytokines during the chronic sepsis contradict the hypothesized CARS-like response. Prelethal plasma levels of IL-6 (Fig. 5⇑A), TNF-α (Fig. 5⇑B), MIP-2 (Fig. 6⇑A), and MCP-1 (Fig. 6⇑B) recorded in 14 septic nonsurvivors revealed high levels of these mediators. Within 24 h before death there were sharp increases in the plasma levels of several proinflammatory cytokines, although these responses were not uniform for all mediators. In contrast to the acute sepsis deaths, the plasma levels of IL-6 became elevated in only five of 14 nonsurviving mice (36%), and in one of 23 healthy mice (Fig. 5⇑A). We observed this phenomenon of IL-6 elevation only in some mice before chronic mortality in our recent study, where IL-6 peaked in 59% of septic nonsurvivors and was undetectable in the remaining 41% (23). Given the outstanding correlation of plasma IL-6 with mortality in acute sepsis deaths, the dichotomy of the prelethal response exhibited by IL-6 in late deaths merits further investigation. Other proinflammatory cytokines exhibited a more uniform response; TNF-α elevation preceded mortality in nine of 14 animals (64%) but was only detected in four healthy animals (Fig. 5⇑B). The MIP-2 (Fig. 6⇑A) and MCP-1 (Fig. 6⇑B) prelethal response was even more robust and uniform where plasma levels rose immediately before death in 10 of 14 mice (71%) for MIP-2 and 12 of 14 (86%) for MCP-1. Whereas only one healthy mouse displayed an elevation of MIP-2, there were nine mice with increased levels of MCP-1. These results indicate that, similar to the early deaths, in some mice late mortality is also preceded by significant production of proinflammatory cytokines. From the perspective of plasma cytokines, the proposed classification of CARS is based upon elevated levels of several key anti-inflammatory mediators such as IL-1 receptor antagonist (IL-1ra), IL-10, and soluble TNF receptor type I (TNF-SRI) and II (TNF-SRII) (20, 21). Analysis of the plasma concentrations of these biomarkers in the late deaths showed both similarities and differences compared with the anti-inflammatory response in the early phase of sepsis. This diversity of the anti-inflammatory response parallels that observed in the proinflammatory reaction, i.e., it shares similarities but it is not identical. High prelethal levels of IL-1ra (Fig. 7⇑A) and TNF-SRI (Fig. 7⇑B) showed an excellent correlation with the outcome, but TNF-SRII and IL-10 did not become elevated before death (graphs not shown). The robust prelethal release of IL-1ra occurred in 13 animals, whereas TNF-SRI rose in 12 mice. The prelethal IL-1ra plasma concentrations were far greater than those observed in healthy post-CLP animals. Despite a rather modest prelethal increase of TNF-SRI (compared with IL-1ra), the uniformly low expression of this cytokine inhibitor in healthy animals produces a highly significant difference between healthy and moribund animals (Fig. 7⇑B). Interestingly, in three of 14 animals the late deaths (e.g., day 8, 21, and 25) were not preceded by a significant increase in biomarker expression, either proinflammatory or anti-inflammatory. In total, the inflammatory response preceding late sepsis mortality is far more heterogeneous compared with the one seen in the acute sepsis (14). Although late sepsis deaths also feature the simultaneous release of both proinflammatory and anti-inflammatory mediators, lower cytokine concentrations and a more limited number of cytokine alterations are observed. In the clinical situation it is often difficult to mark with certainty the time point when a patient becomes septic. In contrast, the time of death is unambiguous. Yet the majority of relevant experimental data uses the onset of sepsis as a reference point. Such analysis is favored because it is technically simplistic and undeniably valuable by helping to define the natural course of the disease process. However, it fundamentally fails to reveal the immunoinflammatory changes occurring shortly before death. Our cytokine data and weight changes were therefore analyzed using the time of death rather than the onset of sepsis as the reference point. Such an approach gives invaluable insight into the prelethal changes of inflammatory plasma markers that can be translated into prospective biomarkers of subsequent mortality. Because the mortality was widely spread throughout the 6–28 day period (Fig. 1⇑), we combined all data into moribund and healthy categories regardless of the day of death. This analysis was performed to determine whether cytokine values and body weight changes 24 h before death would predict subsequent mortality during the chronic phase of sepsis. The diagnostic utility of these cytokine values, as a measure of diagnostic accuracy for each potential predictor, was expressed by the area under the curve (AUC; analyzed with ROC curve method) and graphed in Fig. 8⇓. The complete evaluation for the body weight changes and each cytokine value, including the ROC-generated AUC with confidence intervals and sensitivity/specificity at given cutoff values, is listed in Table I⇑. The selected cytokine concentrations offer the optimal balance between sensitivity and specificity and can be modified to improve either parameter. Prognostic accuracy of individual biomarkers for death. All prelethal (24 h prior) cytokines and body weight changes were evaluated by the ROC curve to determine the prognostic accuracy for the outcome as expressed by the AUC. 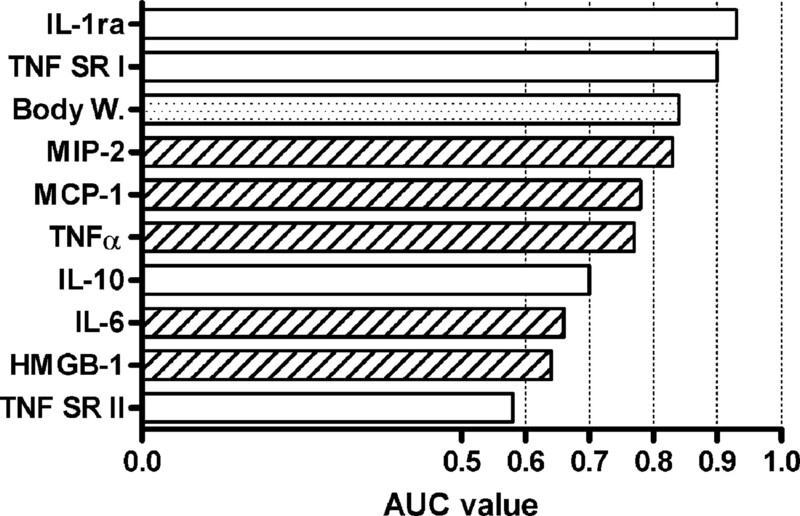 Horizontal bars represent AUC values for each marker. The accuracy of the ROC-AUC test is as follows: 0.9–1, excellent; 0.8–0.9, good; 0.7–0.8, fair; 0.6–0.7, poor; and <0.6, not useful. For all markers except HMGB-1 an increase is correlated with mortality. Several unexpected observations were apparent after this analysis. First, either antiinflammatory markers or proinflammatory markers were good predictors of outcome (Fig. 8⇑; Table I⇑). Second, not all mediators that showed high correlation with early deaths, as reported in our recent study (14), retained their prognostic power for late mortality. This was especially evident in the case of IL-6. Despite its exceptional prognostic capacity (AUC > 0.9) for outcome in acute septic deaths (14, 15), IL-6 failed to be a good predictor of mortality in chronic sepsis (AUC of 0.66; Fig. 8⇑ and Table I⇑). The dramatic prelethal (24 h prior) TNF accuracy that was so apparent in the early sepsis (AUC > 0.9) was markedly diminished before late deaths (AUC = 0.77). This same observation was true for some anti-inflammatory cytokines where the late mortality prediction capacity of TNF-SRII (AUC = 0.58) or IL-10 (AUC of 0.70) was substantially less impressive (early AUC of 0.81 and 0.78, respectively). Table II⇓ lists all cytokines for which correlation with the outcome in the late sepsis remained poor (i.e., AUC < 0.6). The severity of sepsis varies greatly among afflicted patients. In some patients the sepsis-induced immunoinflammatory response may be relatively self-limited whereas in others it may be excessive, leading to impaired perfusion/hypotension, organ dysfunction, and subsequent septic shock and death (41). This multifaceted disease process is further complicated by fluctuations of the immunoinflammatory response during the course of the disease; mild inflammatory status on admission day may become excessive a week later and vice versa. Studies focusing on the progression and treatment of chronic sepsis may be equally important as those investigating the acute phase of the disease in terms of their impact upon long-term patient outcome. Applying our subjective separation of chronic sepsis occurring after day 5 to some of the recent phase III immunotherapy trials, the total number of late deaths (days 6–28) actually surpassed the combined mortality within the initial 5 days (4, 5, 6, 19). Despite the increased mortality in the late phase of sepsis, there is little experimental effort to prove the widely accepted dogma of the linear SIRS-to-CARS transition (20, 21, 36). In our recent article we showed that the cytokine-based inflammatory response in the early phase of murine sepsis exhibits features of the mixed anti-inflammatory response syndrome (MARS) rather than SIRS (14). The current data show that the immunoinflammatory response in the chronic phase of sepsis was both similar and different from the one seen in acute sepsis. Numerous deaths occurring in the late phase of sepsis were preceded by spikes of proinflammatory biomarkers in plasma, in distinct violation of the hypoinflammatory definition of CARS. Interestingly, only selected proinflammatory cytokines were elevated before death. Whereas we noted rather consistent increases of MIP-2 or TNF-α, there were only few prelethal spikes of IL-6 in the current data and in a previous study (23). We encountered a similar pattern of response for anti-inflammatory mediators, which in some cases were excellent (IL-1ra and TNF-SRI; all AUC > 0.9) predictors of outcome. Other anti-inflammatory cytokines (e.g., TNF-SRII and IL-10) were only selectively elevated before death. These data clearly show that several cytokines that accurately predict death during the acute phase of sepsis fail to predict mortality in the chronic phase (14, 15, 17, 18). Identified as a late mediator of systemic inflammation by Wang et al. (33), HMGB-1 offered a new, wider window of opportunity for immunotherapy in sepsis. Septic nonsurvivors had notably higher early HMGB-1 serum levels compared with patients who survived (33), and delayed inhibition (up to 24 h post-CLP) of HMGB-1 activity dramatically improved survival in the acute model of murine peritonitis (39, 40). Our current data concerning the chronic phase of sepsis show that the circulating levels of HMGB-1 are typically not increased. In fact, a decrease in HMGB-1 correlates with mortality. Interestingly, similar results were reported in a recent human study in which HMGB-1 plasma levels (measured up to day 6) were markedly lower in septic patients who died compared with survivors (42). It is possible that a similar trend in the HMGB-1 plasma level would have been observed in the original study (40) had the animals been followed for more days as in the present experiment. The murine CLP model features important similarities to human abdominal sepsis (17, 23, 43) that endotoxin-based models lack (44) and as such provides useful information regarding the natural history of this disease in human patients. Based on our recent (14, 23) and current data it is necessary to revisit, at least in context of sepsis, the concept of a proinflammatory vs an anti-inflammatory response. Given the prelethal MARS-like profiles in both early and late sepsis, the concept of hyperinflammation and hypoinflammation may be better ascertained by the capacity of an organism to respond rather then by the presence of individual mediators in plasma and/or exudative fluids. The data reported here support this concept because all increases, whether for circulating proinflammatory or anti-inflammatory cytokines, were much lower compared with the prelethal elevations in acute sepsis. In some instances these differences were up to 10-fold. Our data unveiled another provocative observation, specifically that a significant number of mice dying in the chronic phase of sepsis had virtually no increases in the prelethal expression of inflammatory mediators whether proinflammatory or anti-inflammatory. This suggests that the hypothesized SIRS-to-CARS transition is not linear as postulated but constantly fluctuates between hyper-responsiveness and hyporesponsiveness. Consequently, any extreme in the direction of either hyperinflammation or immunosuppression would be equally lethal. It needs to be stressed that a simple measurement of circulating cytokines, regardless of how many are measured, cannot serve as a definite assessment of the individual inflammatory response (proinflammatory vs anti-inflammatory). Given that late CARS immunosuppression is also defined by the functional defects in peritoneal/splenic macrophages (45, 46, 47) and MHC class II expression (48, 49), additional studies of the cellular component are required to support the suggested hypothesis that immunosuppression primarily consists of the failure of macrophages to respond to stimuli. Our previous findings showed that macrophages from moribund mice (chronic sepsis) stimulated by TLR 2 and 4 agonists released less IL-6 compared with cells isolated from matching healthy mice (23). Given such an array of possible alterations in the immune response, it is likely that the successful treatment of a septic patient should be based on the day-to-day assessment of the inflammatory status. A survivor whose grave hyperinflammatory response was successfully blunted in the initial phase of sepsis may need an immunoinflammatory stimulation to survive in the chronic phase of the disease. ↵1 This work was supported in part by National Institutes of Health Grant GM 67189. ↵3 Abbreviations used in this paper: SIRS, systemic inflammatory response syndrome; AUC, area under the curve; CARS, compensatory anti-inflammatory response syndrome; CLP, cecal ligation and puncture; HMGB-1, high mobility group box 1; IL-1ra, IL-1 receptor antagonist; MARS, mixed anti-inflammatory response syndrome; ROC, receiver operating characteristic; TNF-SRI, soluble TNF receptor type I; TNF-SRII, TNF receptor type II. Angus, D. C., W. T. Linde-Zwirble, J. Lidicker, G. Clermont, J. Carcillo, M. R. Pinsky. 2001. Epidemiology of severe sepsis in the United States: analysis of incidence, outcome, and associated costs of care. Crit. Care Med. 29: 1303-1310. Sands, K. E., D. W. Bates, P. N. Lanken, P. S. Graman, P. L. Hibberd, K. L. Kahn, J. Parsonnet, R. Panzer, E. J. Orav, D. R. Snydman, et al 1997. Epidemiology of sepsis syndrome in 8 academic medical centers. J. Am. Med. Assoc. 278: 234-240. Martin, G. S., D. M. Mannino, S. Eaton, M. Moss. 2003. The epidemiology of sepsis in the United States from 1979 through 2000. N. Engl. J. Med. 348: 1546-1554. Abraham, E., M. P. Glauser, T. Butler, J. Garbino, D. Gelmont, P. F. Laterre, K. Kudsk, H. A. Bruining, C. Otto, E. Tobin, et al 1997. p55 Tumor necrosis factor receptor fusion protein in the treatment of patients with severe sepsis and septic shock: a randomized controlled multicenter trial: Ro 45–2081 study group. J. Am. Med. Assoc. 277: 1531-1538. Abraham, E., P. F. Laterre, J. Garbino, S. Pingleton, T. Butler, T. Dugernier, B. Margolis, K. Kudsk, W. Zimmerli, P. Anderson, et al 2001. Lenercept (p55 tumor necrosis factor receptor fusion protein) in severe sepsis and early septic shock: a randomized, double-blind, placebo-controlled, multicenter phase III trial with 1,342 patients. Crit. Care Med. 29: 503-510. Fisher, C. J., Jr, J. M. Agosti, S. M. Opal, S. F. Lowry, R. A. Balk, J. C. Sadoff, E. Abraham, R. M. Schein, E. Benjamin. 1996. Treatment of septic shock with the tumor necrosis factor receptor:Fc fusion protein. The Soluble TNF Receptor Sepsis Study Group. N. Engl. J. Med. 334: 1697-1702. Fisher, C. J., Jr, J. F. Dhainaut, S. M. Opal, J. P. Pribble, R. A. Balk, G. J. Slotman, T. J. Iberti, E. C. Rackow, M. J. Shapiro, R. L. Greenman, et al 1994. Recombinant human interleukin 1 receptor antagonist in the treatment of patients with sepsis syndrome: results from a randomized, double-blind, placebo-controlled trial, phase III rhIL-1ra sepsis syndrome study group. J. Am. Med. Assoc. 271: 1836-1843. Fisher, C. J., Jr, G. J. Slotman, S. M. Opal, J. P. Pribble, R. C. Bone, G. Emmanuel, D. Ng, D. C. Bloedow, M. A. Catalano. 1994. Initial evaluation of human recombinant interleukin-1 receptor antagonist in the treatment of sepsis syndrome: a randomized, open-label, placebo-controlled multicenter trial. Crit. Care Med. 22: 12-21. Eichacker, P. Q., C. Parent, A. Kalil, C. Esposito, X. Cui, S. M. Banks, E. P. Gerstenberger, Y. Fitz, R. L. Danner, C. Natanson. 2002. Risk and the efficacy of antiinflammatory agents: retrospective and confirmatory studies of sepsis. Am. J. Respir. Crit. Care Med. 166: 1197-1205. Knaus, W. A., F. E. Harrell, Jr, J. F. LaBrecque, D. P. Wagner, J. P. Pribble, E. A. Draper, C. J. Fisher, Jr, L. Soll. 1996. Use of predicted risk of mortality to evaluate the efficacy of anticytokine therapy in sepsis: the rhIL-1ra phase III sepsis syndrome study group. Crit. Care Med. 24: 46-56. Groeneveld, A. B., A. N. Tacx, A. W. Bossink, G. J. van Mierlo, C. E. Hack. 2003. Circulating inflammatory mediators predict shock and mortality in febrile patients with microbial infection. Clin. Immunol. 106: 106-115. Hack, C. E., E. R. De Groot, R. J. Felt-Bersma, J. H. Nuijens, R. J. Strack Van Schijndel, A. J. Eerenberg-Belmer, L. G. Thijs, L. A. Aarden. 1989. Increased plasma levels of interleukin-6 in sepsis. Blood 74: 1704-1710. Waage, A., P. Brandtzaeg, A. Halstensen, P. Kierulf, T. Espevik. 1989. The complex pattern of cytokines in serum from patients with meningococcal septic shock: association between interleukin 6, interleukin 1, and fatal outcome. J. Exp. Med. 169: 333-338. Osuchowski, M. F., K. Welch, J. Siddiqui, D. G. Remick. 2006. Circulating cytokine/inhibitor profiles reshape the understanding of the SIRS/CARS continuum in sepsis and predict mortality. J. Immunol. 177: 1967-1974. Remick, D. G., G. R. Bolgos, J. Siddiqui, J. Shin, J. A. Nemzek. 2002. Six at six: interleukin-6 measured 6 h after the initiation of sepsis predicts mortality over 3 days. Shock 17: 463-467. Taniguchi, T., Y. Koido, J. Aiboshi, T. Yamashita, S. Suzaki, A. Kurokawa. 1999. Change in the ratio of interleukin-6 to interleukin-10 predicts a poor outcome in patients with systemic inflammatory response syndrome. Crit. Care Med 27: 1262-1264. Turnbull, I. R., P. Javadi, T. G. Buchman, R. S. Hotchkiss, I. E. Karl, C. M. Coopersmith. 2004. Antibiotics improve survival in sepsis independent of injury severity but do not change mortality in mice with markedly elevated interleukin 6 levels. Shock 21: 121-125. Vianna, R. C., R. N. Gomes, F. A. Bozza, R. T. Amancio, P. T. Bozza, C. M. David, H. C. Castro-Faria-Neto. 2004. Antibiotic treatment in a murine model of sepsis: impact on cytokines and endotoxin release. Shock 21: 115-120. Panacek, E. A., J. C. Marshall, T. E. Albertson, D. H. Johnson, S. Johnson, R. D. MacArthur, M. Miller, W. T. Barchuk, S. Fischkoff, M. Kaul, et al 2004. Efficacy and safety of the monoclonal anti-tumor necrosis factor antibody F(ab′)2 afelimomab in patients with severe sepsis and elevated interleukin-6 levels. Crit. Care Med. 32: 2173-2182. Bone, R. C.. 1996. Sir Isaac Newton, sepsis, SIRS, and CARS. Crit. Care Med. 24: 1125-1128. Oberholzer, A., C. Oberholzer, L. L. Moldawer. 2001. Sepsis syndromes: understanding the role of innate and acquired immunity. Shock 16: 83-96. Fisher, C. J., Jr, S. M. Opal, J. F. Dhainaut, S. Stephens, J. L. Zimmerman, P. Nightingale, S. J. Harris, R. M. Schein, E. A. Panacek, J. L. Vincent, et al 1993. Influence of an anti-tumor necrosis factor monoclonal antibody on cytokine levels in patients with sepsis: the CB0006 sepsis syndrome study group. Crit. Care Med. 21: 318-327. Xiao, H., J. Siddiqui, D. G. Remick. 2006. Mechanisms of mortality in early and late sepsis. Infect. Immun. 74: 5227-5235. Ayala, A., G. Y. Song, C. S. Chung, K. M. Redmond, I. H. Chaudry. 2000. Immune depression in polymicrobial sepsis: the role of necrotic (injured) tissue and endotoxin. Crit. Care Med. 28: 2949-2955. Wang, H., W. Li, J. Li, B. Rendon-Mitchell, M. Ochani, M. Ashok, L. Yang, H. Yang, K. J. Tracey, P. Wang, A. E. Sama. 2006. The aqueous extract of a popular herbal nutrient supplement, Angelica sinensis, protects mice against lethal endotoxemia and sepsis. J. Nutr. 136: 360-365. Yang, S., M. Zhou, I. H. Chaudry, P. Wang. 2002. Novel approach to prevent the transition from the hyperdynamic phase to the hypodynamic phase of sepsis: role of adrenomedullin and adrenomedullin binding protein-1. Ann. Surg. 236: 625-633. Ebong, S., D. Call, J. Nemzek, G. Bolgos, D. Newcomb, D. Remick. 1999. Immunopathologic alterations in murine models of sepsis of increasing severity. Infect. Immun. 67: 6603-6610. Ebong, S. J., D. R. Call, G. Bolgos, D. E. Newcomb, J. I. Granger, M. O’Reilly, D. G. Remick. 1999. Immunopathologic responses to non-lethal sepsis. Shock 12: 118-126. Liliensiek, B., M. A. Weigand, A. Bierhaus, W. Nicklas, M. Kasper, S. Hofer, J. Plachky, H. J. Grone, F. C. Kurschus, A. M. Schmidt, et al 2004. Receptor for advanced glycation end products (RAGE) regulates sepsis but not the adaptive immune response. J. Clin. Invest. 113: 1641-1650. Wesche-Soldato, D. E., C. S. Chung, J. Lomas-Neira, L. A. Doughty, S. H. Gregory, A. Ayala. 2005. In vivo delivery of Caspase 8 or Fas siRNA improves the survival of septic mice. Blood 106: 2295-2301. Wichterman, K. A., A. E. Baue, I. H. Chaudry. 1980. Sepsis and septic shock: a review of laboratory models and a proposal. J. Surg. Res. 29: 189-201. Knight, P. R., A. Sreekumar, J. Siddiqui, B. Laxman, S. Copeland, A. Chinnaiyan, D. G. Remick. 2004. Development of a sensitive microarray immunoassay and comparison with standard enzyme-linked immunoassay for cytokine analysis. Shock 21: 26-30. Efron, B., R. Tibshirani. 1993. An Introduction to the Bootstrap Chapman and Hall, New York. Lasko, T. A., J. G. Bhagwat, K. H. Zou, L. Ohno-Machado. 2005. The use of receiver operating characteristic curves in biomedical informatics. J. Biomed. Inform. 38: 404-415. Hotchkiss, R. S., I. E. Karl. 2003. The pathophysiology and treatment of sepsis. N. Engl. J. Med. 348: 138-150. Xiao, H., D. G. Remick. 2005. Correction of perioperative hypothermia decreases experimental sepsis mortality by modulating the inflammatory response. Crit. Care Med. 33: 161-167. Nemzek, J. A., H. Y. Xiao, A. E. Minard, G. L. Bolgos, D. G. Remick. 2004. Humane endpoints in shock research. Shock 21: 17-25. Wang, H., H. Liao, M. Ochani, M. Justiniani, X. Lin, L. Yang, Y. Al-Abed, H. Wang, C. Metz, E. J. Miller, et al 2004. Cholinergic agonists inhibit HMGB1 release and improve survival in experimental sepsis. Nat. Med. 10: 1216-1221. Yang, H., M. Ochani, J. Li, X. Qiang, M. Tanovic, H. E. Harris, S. M. Susarla, L. Ulloa, H. Wang, R. DiRaimo, et al 2004. Reversing established sepsis with antagonists of endogenous high-mobility group box 1. Proc. Natl. Acad. Sci. USA 101: 296-301. Deans, K. J., M. Haley, C. Natanson, P. Q. Eichacker, P. C. Minneci. 2005. Novel therapies for sepsis: a review. J. Trauma 58: 867-874. Sunden-Cullberg, J., A. Norrby-Teglund, A. Rouhiainen, H. Rauvala, G. Herman, K. J. Tracey, M. L. Lee, J. Andersson, L. Tokics, C. J. Treutiger. 2005. Persistent elevation of high mobility group box-1 protein (HMGB1) in patients with severe sepsis and septic shock. Crit. Care Med. 33: 564-573. Newcomb, D., G. Bolgos, L. Green, D. G. Remick. 1998. Antibiotic treatment influences outcome in murine sepsis: mediators of increased morbidity. Shock 10: 110-117. Remick, D. G., P. A. Ward. 2005. Evaluation of endotoxin models for the study of sepsis. Shock 24: (Suppl. 1):7-11. Ayala, A., Z. K. Deol, D. L. Lehman, C. D. Herdon, I. H. Chaudry. 1994. Polymicrobial sepsis but not low-dose endotoxin infusion causes decreased splenocyte IL-2/IFN-γ release while increasing IL-4/IL-10 production. J. Surg. Res. 56: 579-585. Ayala, A., P. J. O’Neill, S. A. Uebele, C. D. Herdon, I. H. Chaudry. 1997. Mechanism of splenic immunosuppression during sepsis: key role of Kupffer cell mediators. J. Trauma 42: 882-888. Ayala, A., M. A. Urbanich, C. D. Herdon, I. H. Chaudry. 1996. Is sepsis-induced apoptosis associated with macrophage dysfunction?. J. Trauma 40: 568-573. ; discussion 573–564..
Newton, S., Y. Ding, C. S. Chung, Y. Chen, J. L. Lomas-Neira, A. Ayala. 2004. Sepsis-induced changes in macrophage co-stimulatory molecule expression: CD86 as a regulator of anti-inflammatory IL-10 response. Surg. Infect. 5: 375-383. Tschaikowsky, K., M. Hedwig-Geissing, A. Schiele, F. Bremer, M. Schywalsky, J. Schuttler. 2002. Coincidence of pro- and anti-inflammatory responses in the early phase of severe sepsis: longitudinal study of mononuclear histocompatibility leukocyte antigen-DR expression, procalcitonin, C-reactive protein, and changes in T-cell subsets in septic and postoperative patients. Crit. Care Med. 30: 1015-1023.